The UK government’s nuclear innovation advisors are recommending a £1 billion, five-year investment in advanced nuclear technologies to help meet the country’s clean energy commitments. The recommendation comes in an annual report from the Nuclear Innovation and Research Advisory Board (Nirab), its first since being re-convened in 2018. Nirab brings together around 40 leading nuclear professionals from industry and academia to advise government on publicly-funded research, and is chaired by fomer Nuclear AMRC chief executive Mike Tynan. To meet the requirements of the UK’s 2017 Clean Energy Strategy, the report urges government to work with industry to define a roadmap for future nuclear new build. A sustained cost-competitive programme of new reactors – including current Gen III+ designs as well as new kinds of advanced modular reactor (AMR) and small modular reactor (SMR) – is needed to meet legal targets for decarbonisation, and early involvement will create significant opportunities for job creation and economic growth for the UK. Government support for demonstrating advanced reactors is essential for attracting and enabling the necessary level of private investment, the report notes, and government should invest alongside industry to facilitate an advanced nuclear technologies build programme capable of delivering an operational reactor by 2030. The government is currently investing in new nuclear technologies through the Nuclear Innovation Programme, with £180 million committed from 2016–21. The report highlights some case studies from the current phase of the Nuclear Innovation Programme, including the Simple and Inform projects led by the Nuclear AMRC. 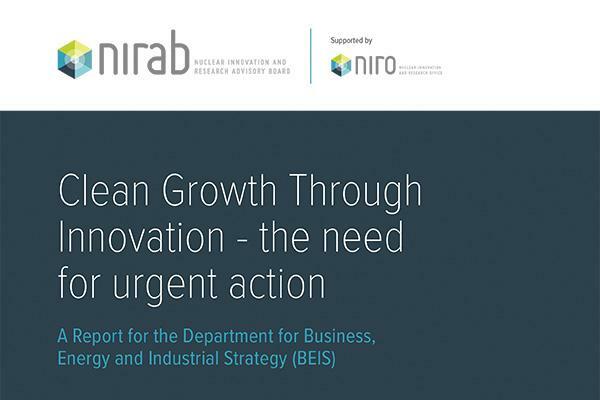 Over the following five years, Nirab recommends that the government invest around £1 billion in key programmes: around £600 million in advanced nuclear technology demonstration; £300 million in research to develop key UK capabilities and align the supply chain to market opportunities; and £100 million in critical infrastructure to support prototyping and demonstration of new reactor concepts. International collaboration is vital for the UK to play a significant role in commercialising advanced nuclear technologies, the report notes. Nirab recommends that the government establishes an effective international strategy, and reviews the impact of Brexit on UK nuclear programmes once the new arrangements become clear. To share the latest results and projects from the Nuclear Innovation Programme, the Nuclear AMRC and NNL are hosting a major two-day conference in the summer. Nuclear Innovation UK takes place on 2–3 July in Sheffield, and will feature presentations on current projects as well as discussions on future opportunities. Access the full Nirab report.